Buy The Smart Party a Coffee. ko-fi.com/thesmartparty - Ko-fi ❤️ Where creators get paid by fans, with a 'Buy Me a Coffee' button. Here at the Smart Party we are all about squeezing the juice out of gaming. Whether GMing, playing, creating or publishing, we have advice, war stories and shared experiences gleaned from decades on gaming's front line. 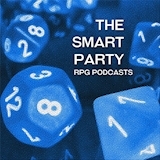 We serve that up through our regular podcast, What Would The Smart Party Do? as well as via our blog and associated publishing adventures. We do what we do because we love it! But, there are internet costs, and buying new mics or other equipment and for loyal Patreon followers, we're producing a zine too. We don't demand cash off anyone and if you want to listen for free - that all good! There's a middle ground though of pleasant folk who would like to throw a couple of shekles our way every now and then. Cool beans! Buy us a coffee - and make us feel warm inside. Secured Payments. Support goes to The Smart Party's account. Upgrade The Smart Party to a yearly Gold Membership with a one-time payment.